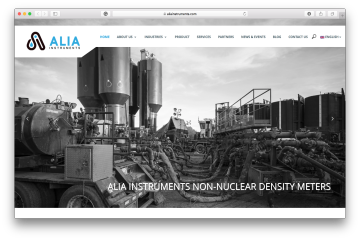 Alia Instruments is proud to announce the launch of our new website as a result of the evolving market and our rapidly expanding role as a supplier of non-nuclear density meters, in demanding slurry applications, to various industrial markets. Our new website provides a clear message of who we are and what we stand for. It provides all relevant information about our density meter but as well provides insight into the possible use of these meters in various applications. Besides the content, it also meets today’s needs of our customers. It is supported on all devices and with eight of the most used languages around the globe, we foster the ease of use to our customers for who English is not their first language. Together with the website we have further developed our branding and applied it, amongst other things, in a new line of brochures. We will continue to develop and improve the website. We will add more applications, video content and additional downloads, to provide you with all the information you need while considering our density meters.